They say what the son loses, the grandson seeks to regain. I’m ashamed to say I’ve learned more Welsh with Close Up Ceri in these last few days than in all the time I spent in my relatives’ farmhouses in the Land of my Fathers when I was too young to barely carry the lambs across the lush green grass for bottle feeding. 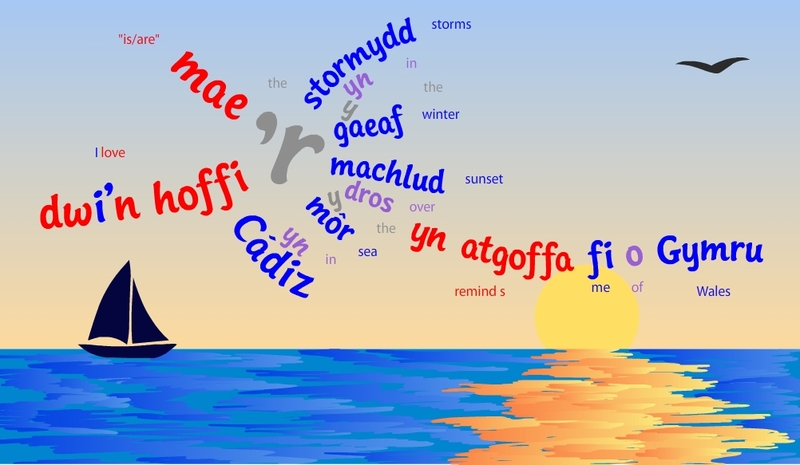 Welsh is a Celtic language, typically VSO, the red verbs come at the start of the sentence. “Dwi’n hoffi” means something in-between “I like”, “I love” and “I’m fond of”. “Mae” is a kind of third person verb tag of “to be”, both for singular and plural nouns, and here starts the sentences about reminding Ceri of Wales. Welsh is full of contractions and inflections, and the big grey “‘r” meaning “the” attaches itself to the red verbs. Despite being neighbours, English and Welsh it seems have substantially different grammars. Ceri lives in Spain. Her poem, and with its strong repetition and parallelism I think it’s mesmeric, it must surely bring a tear to her eye, for growing up in beautiful Cádiz she knows what her children will have surely gained, but also what they will have surely lost. Thanks Adam, very nice words to hear. Thank you so much David for converting my few simple sentences into a poem – and into such a beautiful plant! Wow! I had never heard Welsh before – only words here and there. I absolutely love how it sounds, so musical. It was also super to hear your voice, Ceri! I love the videos, the voices, the explanation, I love Welsh and Greek, too, tho I’d never really heard Greek before! Greek vocabulary is so similar to Italian, I had great fun thinking of related words. Welsh just “yn atagoffa fi o Gymru” which is always a good thing! Dwi’n hoffi Gymru. You are currently reading Learn Welsh with Ceri at language garden.